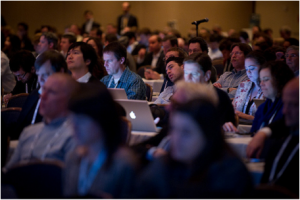 How Many Publishing Conferences Do You Attend Each Year? Is there room for more lukewarm coffee, calorific cookies and powerpoint presentations in your life? There’s no question about it — publishing conferences are proliferating at a rapid pace, both in the United States and Europe, but as discussed in today’s feature story, in places like India and China. Last year, after pointing out the growing number of events, I also wondered if the number of events weren’t inadvertently creating a publishing elite? After all, paying for conferences out of one’s own pocket is daunting. If you’re a company employee, you can likely convince your boss (or accounting department) to stump up for a few key events. But what of the solo publishing practitioners — of which there are also many more these years? So, tell us, how many publishing events do you actually pay to attend during the course of a year? Do you merely limit it to Frankfurt, or London, or BookExpo, or another local event? Or do you include any number of the Tools of Change events, or Publishers Launch, or even something like Metadata Perspectives (a part of the Frankfurt Book Fair Academy — get your discount here)? Are you feeling burnt out or energized by the growing number of events? Is there room for more lukewarm coffee, calorific cookies and powerpoint presentations in your life?